I see the story in real time as write and convey those images to the reader. 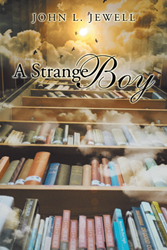 Travel back in time to the late 1950s with John L. Jewell’s debut novel, “A Strange Boy.” This story of mystery, adventure and supernatural will intrigue readers as the protagonist, Leslie Johns, takes a journey of self-discovery and dives into an investigation of his father’s disappearance. Leslie may not be an average kid, but he faces many of the same challenges of a boy coming-of-age and learning to understand tragedy, loss and growth. Jewell has always had an active imagination and love of storytelling. He began writing at age 62 in search of meaning and purpose after the loss of his beloved wife. “My sister gave me a pen and paper one day and told me to write down my thoughts, ideas and feelings, and so the book began,” Jewell said. Jewell intends to continue his series about the Johns family. For more information, visit http://www.johnljewell.com. John L. Jewell began his lifelong career in catering as a trainee cook and ascended to the level of contract manager. Currently, he is retired and spends his time writing. This is the first book of an intended series.